When the creator of a virtual reality world called the OASIS dies, he releases a video in which he challenges users to find an Easter Egg which will give the finder his fortune. First the first time since 2005’s War of the Worlds, Steven Spielberg returns to the realm of science-fiction with 2018’s Ready Player One. Based on the Ernest Cline novel, we head to Ohio circa the year 2045 to find a real world that presents a depressing, harsh environment. To escape this misery, most people spend their time in an online virtual reality circumstance known as “The OASIS”. Genius co-creator James Halliday (Mark Rylance) died and declared that whoever solves a series of riddles/puzzles will inherit his creation. Via his avatar “Parzival”, young Wade Watts (Tye Sheridan) embarks on a quest to achieve this goal. Of course, he encounters a lot of competition along the way, including “IOI”, a corporation whose CEO Nolan Sorrento (Ben Mendelsohn) desperately wants this prize all to himself. After Spielberg’s commercial – and arguably creative – peak with 1982’s ET, he seemed to get more concerned that he wasn’t “serious” enough. He next made 1984’s Indiana Jones and the Temple of Doom, so he still worked in the realm of action/fantasy, but that flick took on a darker tone that expected from Spielberg and seemed less satisfying than its predecessors. With 1985’s Color Purple, a new “adult” Spielberg took charge, and that essentially has remained the director’s dominant persona since then: a “serious filmmaker” who occasionally indulges the popcorn ways of his youth. To be sure, many of Spielberg’s “fun” movies over the last 30 years have been quite good. 1993’s Jurassic Park can be viewed as a classic, and I’ve enjoyed some of his other non-dramatic tales as well. Nonetheless, these simply don’t approach the genius that Spielberg demonstrated from 1975-82, and Player brings us another “close but no cigar” effort. While entertaining enough in its own right, the movie ends up as “empty calories”. By that I mean that Player keeps us reasonably involved and entertained while it runs, but once the movie ends, it rapidly departs the memory. The same issue impacted 2011’s Adventures of Tintin, as it gave us an enjoyable tale that delighted well enough as it went but that lacked the dimensionality to stay with the viewer later. That wasn’t an issue after one watched the “classic years” Spielberg films. Obviously I won’t claim that people debated the nuances of Raiders or Jaws like they would something from Kubrick or Bergman, but those movies nonetheless engaged the imagination and spirit in such a way that they made a serious emotional connection and stayed wedged in the viewer’s mind long after the credits rolled. Some of this comes from the generic nature of the plot. Player offers a basic “hero’s quest”, albeit one clearly influenced by Willy Wonka - so much so that the advertising for Player boasted hints of the Wonka tune “Pure Imagination”. In addition to the well-worn storyline, the characters seem largely banal. Halliday and partner Ogden Morrow (Simon Pegg) become interesting more due to the actors who play them than because of the roles themselves, and the same goes for our lead villain. I like Mendelsohn but there’s only so much he can do with a scenery-chomping one-dimensional character like Sorrento. Our lead Wade seems wholly forgettable, though some of the blame stems from the film’s construction. We don’t see a lot of Wade in human form, as the movie prefers to focus on Parzival. This automatically robs of main character of humanity. Sure, Parzival is a humanoid avatar, but he doesn’t come across like a believable person, and we see far too little of the actual Wade to buy into the role and worry about his fate. Where Player stands out from the crowd connects to its main gimmick: an obsessive focus on pop culture from the 1980s. We learn that Halliday remained stuck on that era, so OASIS and the movie both teem with references based on that period. These can be fun to view and ferret out, especially for those of us who grew up in the decade. It’s also a delight to see Spielberg wink at himself and reflect on his own cinematic glory years in this manner. Spielberg remains wholly able to construct an exciting action sequence, and those elements give Player another boost. Granted, I feel the virtual reality orientation robs them of some impact – sorry, but as much as the film emphasizes real-world consequences, it seems difficult for me to fret too much about events in a CG universe – but these still boast vivid, lively moments. All of this makes Player a perfectly enjoyable way to spend 140 minutes, and I’ll probably keep the film in my collection. It simply lacks the heart and depth it needs to become something more than a fun time-killer, though. 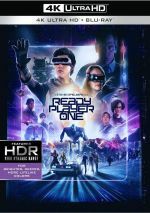 Ready Player One appears in an aspect ratio of approximately 2.40:1 on this Blu-ray Disc. Overall, the image seemed satisfying. In essence, Player brought two different visual experiences: the live-action “real world” material and the entirely CG “OASIS” footage. Unsurprisingly, the latter fared best, as those elements boasted meticulous delineation with vibrant hues and deep blacks. Also unsurprisingly, the live-action shots came up a little short by comparison. Though these offered largely solid sharpness, a little softness crept into some wider shots. Colors also tended to be a slight bit less dynamic, and blacks seemed slightly flatter. Those were minor criticisms, though, as both parts of the film looked quite good. I never saw jagged edges or moiré effects, and print flaws remained absent. Led by the excellent quality of the CG elements, this became a “B+” presentation. Downconverted to Dolby TrueHD 7.1, the film’s Dolby Atmos soundtrack excelled and brought us a vivid sonic impression. Of course, the film’s many action scenes worked best. With a lot of vehicles, weapon fire and other mayhem, the mix used the various channels to involve us in the material. Quieter scenes boasted a nice sense of environment as well, and music added solid stereo presence to the music. The soundscape kicked into gear often and formed a seamless package. Audio quality followed suit, with speech that appeared concise and distinctive. Music sounded full and lush as well. As expected, effects became the most prominent aspect of the mix, and those elements seemed accurate and dynamic, with taut low-end when appropriate. This became a satisfying soundtrack for an action film. With a total running time of one hour, 57 minutes, 49 seconds, the set includes six featurettes. 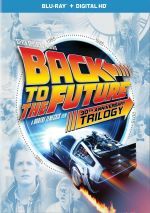 This collection brings “The ‘80s: You’re the Inspiration” (5:38), “Game Changer: Cracking the Code” (57:22), “Effects for a Brave New World” (24:39), “Level Up: Sound for the Future” (8:03), “High Score: Endgame” (10:04) and “Ernie & Tye’s Excellent Adventure” (12:00). Across these, we find comments from director Steven Spielberg, novelist/co-screenwriter Ernest Cline, co-screenwriter Zak Penn, producer Dan Farah, Kristie Macosko Krieger and Donald De Line, production designer Adam Stockhausen, costume designer Kasia Walicka Maimone, special effects supervisor Neil Corbould, stunt coordinator Gary Powell, picture vehicle supervisor Graham Kelly, visual effects supervisors Grady Cofer, Matthew Butler and Roger Guyett, animation supervisor David Shirk, virtual production concept design supervisor Alex Jaeger, virtual production lab supervisor Joe Henderson, previsualization supervisor Scott Meadows, visual effects producer Daniel Brimer, computer graphics supervisor Brian Gazdik, digital effects supervisor Joel Behrens, supervising sound designer/re-recording mixer Gary Rydstrom, sound designer Kyrsten Mate, composer Alan Silvestri, and actors Tye Sheridan, Lena Waithe, Simon Pegg, Ben Mendelsohn, TJ Miller, Philip Zhao, Olivia Cooke, Win Morisaki, Mark Rylance, and Hannah John-Kamen. The programs examine 1980s inspirations and their use in the film, the novel’s roots and path to the screen, adaptation, story and characters. We also look at cast and performances, production and costume design, the use of motion capture, cinematography, action and stunts, various effects, sound design and music. Inevitably, we get a little too much happy talk here, as quite a lot of praise comes along for the ride. Nonetheless, we still learn a ton about the production, particularly in the technical domains, as those cover a slew of informative elements. The featurettes become useful and interesting for the most part. The disc opens with an ad for the Blade Runner: Revelations videogame. No trailer for Player appears here. 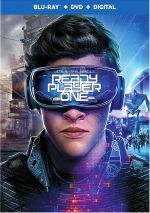 Although Ready Player One offers a fun action experience, it doesn’t quite stick with the viewer in a way that would make it great. The movie brings us a lively 140 minutes that evaporates from the brain as soon as it ends. The Blu-ray offers largely solid picture along with terrific audio and a pretty engaging collection of featurettes. Player is “B”-level Spielberg but it still entertains.